Lulzim Basha, the head of the main opposition Democratic Party of Albania (EPP-affiliated), accused the European Commission of being too lenient with the government in place “for the sake of stability”. “Brussels has chosen to focus on the technical process of law harmonisation for the sake of stability to the cost of democracy […] this has been misused by autocratic leaders in the Balkans, who are now endangering stability because of corruption, collusion with the organised crime and state capture,” Basha told EURACTIV.com in a telephone interview. 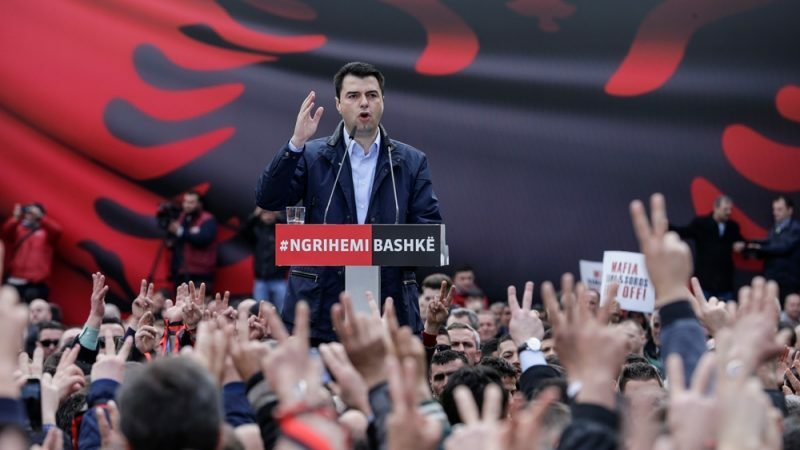 The centre-right politician (European People’s Party-EPP) said the judicial reforms put forward by the ruling socialist government of Edi Rama have changed nothing, considering the continuing impunity of politicians and organised crime bosses. “There have been two justice standards for a long time: one for normal people and one for the powerful,” Basha said of Albania. “We are the only country in the world whose Constitutional Court has been defunct for one year […] Albania today is in a situation where there is no justice,” he added. However, Prime Minister Rama’s ruling Socialist Party has been praised by the European Commission and the European Parliament for the judicial reforms. Both EU institutions have called on the EU Council to open the EU negotiations for the Balkan country. On the other hand, Basha’s party has backed a series of protests against Rama and demanded his resignation. The centre-right party also boycotts the Albanian parliamentary sessions, but this was recently criticised by the EU executive. EU spokesperson Maja Kocijancic said last month that boycotting the parliament was “damaging and goes against the country’s efforts” to join the EU. 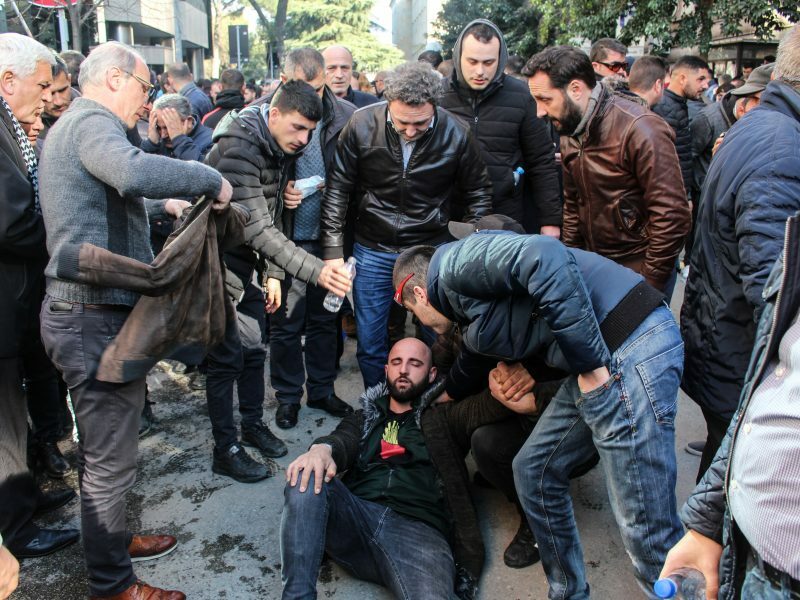 Albania’s centre-right opposition said Monday (18 February) its MPs would resign from parliament, the latest in a series of dramatic protests against Prime Minister Edi Rama, who they accuse of corruption. Basha, who was also a former mayor of Tirana, hinted that the European Commission is ignoring the reality on the ground. “There’s a discrepancy on what is happening in Albania between reports from European and international agencies,” he said. He noted that while reports from international organisations, such as Transparency International or the US State Department, point out the deep problems of crime, drugs and state capture, there are public statements from Brussels that overlook these problems altogether. “So democracy has been sacrificed to keep the stability and now we lack both. This must be a lesson for the future. The lack of democracy and rule of law leads to instability,” Basha said. Referring to the ongoing dialogue between Kosovo, where ethnic Albanians are a majority, and Serbia, he said a solution should be found but the territorial swap Belgrade has been pushing for should not take place. Basha also spoke about the North Macedonia name change deal between Athens and Skopje, the so-called Prespa Agreement, saying that it’s a historic moment which shows how the region can move forward. Just before last summer, Tirana and Athens were also negotiating a package deal to settle their own bilateral issues, including the exclusive economic zone (EEZ) between the two countries, the sea zone where a state has exclusive rights on exploration and use of marine resources. However, the talks have been stalled since then due to divisions between the Albanian government and the presidency, local media reported. Basha said Greece was a strategic partner for Albania and the Albanian-Greek relations will be his priority. “These relations are not at their best at the moment and this must change. My aim is to engage in a sincere and productive dialogue to resolve all outstanding issues,” he said, highlighting also the need for an “equitable solution” for the EEZ. Asked what stance he would keep at the EPP Congress on 20 March regarding Hungary’s Orbán issue, he said the ultimate objective is to achieve harmony in the EU’s centre-right family through dialogue. “We are getting informed by all sides. And we also expect steps to be taken within the family that should produce more clarity in the coming hours and days,” he said without elaborating.